So now that I've built this big power supply (50 vdc @ 200 amps) I want to test it with some load on it. At first I thought I could try using several car headlamps in series, I tried that, but the first one in the string kept burning out, and so I stopped trying that. It would get expensive to try that for long. (Although I think with enough of them in series it would probably work). I gave up on that idea. Then I came across a website that talked about dumping excess DC from Solar and Wind farms to AC hot water heating elements. Turns out these elements are just huge resistors. So I went and bought one for $9 and change from Lowes. The one I bought was for 120v AC @ 1500 watts. It is 9.1 Ohms. 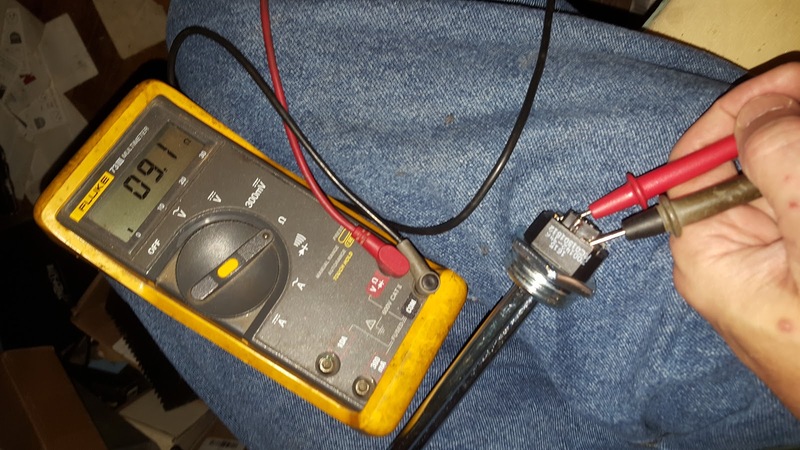 So using some simple calculations this is approximately what I should see from using this heating element as a load on my power supply. Since these heating element can't survive out of water or cooling more than a few seconds (normally) I only tested this for less than 10 seconds. (longer tests will be coming soon). My Fluke meter measured about 5.7 amps in the real world. So this is roughly about 310 to 320 watts being drawn on a 10.8 kilowatt (54vdc @ 200amps) capable power supply. Not much of a load test really. But it's a start. Since these heating elements are the cheapest 1500 watt 9 ohm resistor available (I'm pretty sure) this is probably what I'll continue to use to load test. Although I'll probably buy 10 of them so I can pull about 56 amps on the supply. I want to be able to pull at least 50 amps @ 54 vdc for 1 full minute. Then pause 1 min, then pull again, then pause on-off-on over and over for a while.